As the debut model of a brand new standard, the Panasonic Lumix DMC-G1 is a rare, exciting and brave camera. Like all debut models it exclusively represents the benefits of the new standard and its relevance in the market, while also having to work hard against established rivals. Having used the Lumix G1 for some time now, we’d say it succeeds strongly in both respects. The Lumix G1 is the first model to employ the Micro Four Thirds standard, jointly developed by Panasonic and Olympus. The standard is designed to deliver cameras with DSLR-sized sensors and interchangeable lenses, but in a smaller and lighter form factor that’s easier to use than traditional DSLRs. Starting with the headline size, the Lumix G1 is certainly very small, more akin to a super-zoom compact than a traditional DSLR. As you can see in our Design page, the Lumix G1 is noticeably smaller than popular models like the Canon EOS 450D / XSi, but sensible ergonomics and a decent grip still make it comfortable to hold and use. This would appear to confirm Micro Four Thirds’ claim of allowing smaller bodies and lenses, but anyone comparing dimensions will already know the Olympus E-420 body is only fractionally larger (and a few grams lighter), despite being a ‘proper’ DSLR. At first this appears to rain on Micro Four Thirds’ parade, but it’s important to note the Lumix G1 is not only a few mm smaller in every dimension, but has a bigger grip, a much larger viewfinder, a flip-out screen and a broader 23 AF areas to the 3-point / 11 area systems of the E-420. Crucially, fit both with their kit lenses and the Panasonic becomes a stabilised system. In terms of ease of use, the G1’s constant Live View system means it can inherit the best of the technologies available to today’s compacts, including Panasonic’s cunning Intelligent Auto mode, Scene and Face Detection. Switch the camera to Intelligent Auto and it’ll competently do everything for you, or head to traditional PASM when you want more control. As for image quality, the Lumix G1 employs a sensor that’s the same size as those in full-sized Four Thirds bodies. These sensors may be physically a little smaller than the APS-C chips in rival DSLR systems, but the G1’s new 12.1 Megapixel Live MOS model manages to keep up with cameras like the Canon EOS 450D / XSi in terms of noise levels; indeed it avoids much of the Canon’s undesirable chroma noise at the highest sensitivities to deliver a result many will find preferable. See our High ISO Noise results page. In-camera JPEGS can be a little refrained compared to the punchy output from some entry-level models, but that’s easily corrected if desired. Overall image quality is also of course greatly influenced by the optics and we’re pleased to report both the G VARIO 14-45mm and 45-200mm kit lenses perform well for their class, delivering sharper results to the edge of their frames than most kit lenses of rival systems. So far so good, but there have been wide concerns over some aspects of the Micro Four Thirds system. 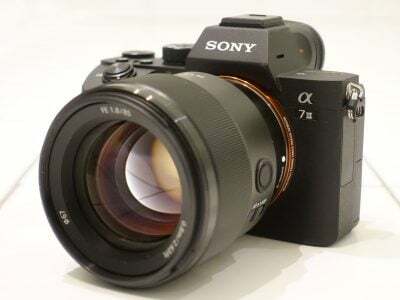 Most notably, by removing the reflex mirror and optical viewfinder to save space and weight, the standard lacks two of the most loved aspects of traditional DSLRs: a quality optical viewfinder for composition and a fast phase-change autofocus system. Indeed when traditionalists realise the G1 has not just an electronic viewfinder, but also relies on a contrast-based system for autofocus, they understandably respond with utter horror. But Panasonic has successfully addressed both fears. The G1 inherits technology from Panasonic’s professional cameras to deliver a ‘Live View Finder’ with a surprisingly large and detailed view with no visible pixilation. It looks fantastic in use, is easy to manually focus, and overall much preferred to the tiny optical SLR viewfinders of models like the Olympus E-420 and E-520. It’s even bigger than the views through the EOS 450D / XSi or Nikon D90, while also enjoying the benefits of other electronic viewfinders including 100% coverage, dynamic graphics, a live histogram and alignment grids. It is quite simply a triumph, and don’t forget you also have a great quality 3in fully-articulated screen to use as an alternative. Moving onto autofocus, the G1 banishes the experience of traditionally slow contrast-based systems to deliver performance that’s as quick or even faster than the phase-change systems of most budget DSLRs. The G1 and kit lens snap into focus almost instantly, while also boasting 23 broad areas compared to the usual 11, 9 or even 3-points of budget and mid-range phase-change DSLRs. So with the G1 you get all the benefits of Live View, without the major downsides – fortunate since the G1 is permanently in Live View. So with size, quality and ease of use confirmed, and concerns over the viewfinder and AF system quashed, Panasonic has clearly done a great job, but that’s not to say there aren’t issues with the Lumix G1. First of all, like all new systems, the choice of lenses is currently small. Micro Four Thirds may have what appears to be the trump card of an adapter which lets it use full-sized Four Thirds lenses (with the same field reduction factor) but there’s two good reasons why you might not bother: first is an increase in physical size, and secondly is a thornier issue of AF compatibility. As a contrast-based system, the Lumix G1 will only autofocus with existing Four Thirds lenses featuring updated firmware, and at the time of writing, that meant just three from Leica and five from Olympus. All other Four Thirds lenses become manual focus only. Even those with updated firmware will only support Single AF mode, with Continuous AF exclusively reserved for Micro Four Thirds lenses. So if you’re considering the Lumix G1, or future Micro Four Thirds products, it’s important to know about the lens range and limitations. That said, the two kit lenses cover most eventualities and deliver great quality for the money, while Panasonic’s roadmap has three new lenses slated for 2009. Ultimately while the Live View Finder is superb, there’s no denying you’re looking at an electronic image (especially when it gets noisy and jerky in very low light) and some may simply prefer using a traditional optical SLR viewfinder. You also can’t get away from the fact any camera operating exclusively in Live View is going to eat through battery power quicker, with the Lumix G1 offering roughly two thirds the number of shots per change of a DSLR using its viewfinder only. Of course switch the DSLR to Live View, and it too will have shorter battery life. Perhaps the biggest disappointment with the Lumix G1 though is a lack of movie mode. These are by no means a foregone conclusion from a camera with a DSLR sensor, but the fact is two of the highest-profile DSLRs in recent times offer the facility, and since the G1 operates 100% in Live View and a large number of its target market are upgrading from point and shoots – well, they’ll simply expect a movie mode. 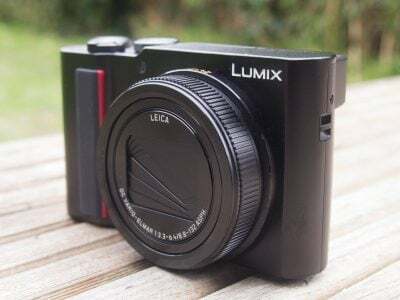 Panasonic then arguably scuppered many of the G1’s sales by announcing it would launch a Micro Four Thirds model with video recording during 2009, not to mention a super-zoom lens to go with it. But while initially perplexing and disappointing, you only have to spend a little time with the Lumix G1 to realise it easily stands up without video recording. So before our final verdict, let’s see how it compares to rival models. Canon’s EOS 450D / XSi is the best-selling DSLR at its price point, so it’s the model Panasonic’s Lumix G1 has to beat. 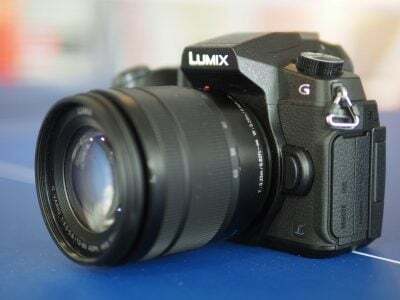 Both cameras share 12 Megapixel resolution with similar quality (albeit with different aspect ratios), and optically-stabilised kit lenses, but beyond here there are considerable differences, many in favour of the Lumix G1. As a traditional DSLR, the Canon 450D / XSi of course features an optical SLR viewfinder which traditionalists may prefer to the 100% electronic live-view system of the Lumix G1. It also features slightly quicker 3.5fps continuous shooting, PC remote-control software, longer battery life (with the optical viewfinder), an optional battery grip, and crucially, a much larger lens catalogue with none of the AF issues facing the G1 with existing Four Thirds lenses. In its favour, the Lumix G1 is smaller and lighter without compromising comfort, sports a more detailed screen that flips-out and twists to any angle, a comfortably larger viewfinder image with graphics and 100% coverage, a 23-area AF system, quicker Live View autofocus (although to be fair the Canon matches the AF speed with its phase-change system), the highly capable Intelligent Auto mode with usable face detection and an HDMI port. The Lumix G1 kit lens also performed better than Canon’s in our tests and the kit itself comes in a little cheaper than the 450D / XSi from many online vendors. In terms of overall features and usability, the Lumix G1 is arguably a superior camera, although some will still prefer the optical viewfinder of a traditional DSLR, while Canon’s huge lens catalogue is unrivalled. The decision between them will have a lot to do with how much you value access to those lenses and of course which body and feature-set best-suits you in person. See our Canon EOS 450D / XSi review for more details. The Olympus E-520 is one of the best-featured DSLRs for the money and remains a popular choice against newer models. Both it and the Lumix G1 feature the same-sized sensors and the highly effective SSWF system to protect them from dust, but again there are many differences. In its favour, the E-520 boasts built-in Image Stabilisation which works with any lens you attach, slightly quicker 3.5fps continuous shooting, a traditional optical viewfinder which despite its small size may be preferred by some, and greater compatibility with the existing Four Thirds lens catalogue – although it should be noted there are still AF restrictions in Live View. The Lumix G1’s counter-arguments are again small size, the bigger and more detailed flip-out screen, a much larger viewfinder image with graphics and 100% coverage, a 23-area AF system, quicker Live View autofocus (although to be fair the E-520 matches the AF speed with its phase-change system), the highly capable Intelligent Auto mode with usable face detection, and an HDMI port. The G1 also sports two additional Megapixels with no apparent compromise on noise levels. The tiny viewfinder and basic 3-point AF system are again the Achilles’ Heel of the E-520 and both addressed by the Lumix G1, but the E-520 remains comfortably cheaper and a compelling option. See our Olympus E-520 review for more details. In terms of functionality, Sony’s Alpha A300 and A350 share a number of aspects with the Lumix G1 including an articulated screen and quick Live View implementation, but there are again considerable differences. In their favour the Sony’s boast built-in stabilisation which works with any lens you attach, and a unique Live View system which cunningly uses the traditional phase-change AF system for quick response. While their viewfinders are very small, some will still prefer them to the electronic nature of the G1. In its favour, the Lumix G1’s screen is bigger and more detailed while also twisting in two axes for greater compositional flexibility, a much larger viewfinder image with 100% coverage and live graphics, a 23-area AF system, more accurate Live View with 100% coverage and manual focus assistance, the highly capable Intelligent Auto mode with usable face detection, and an HDMI port. In terms of price and resolution, the Lumix G1 falls roughly between the 10 Megapixel A300 and 14 Megapixel A350, but the Panasonic’s image quality is superior at higher sensitivities. The unique handling of both Sony’s though, not to mention their built-in stabilisation and a growing range of quality lenses makes them a popular choice. See our Sony Alpha DSLR-A300 review and Sony Alpha DSLR-A350 review for more details. At the time we completed this review, Olympus announced the E-620. This relatively compact DSLR measuring 130x94x60mm boasts a powerful feature-set including 12 Megapixel resolution, built-in stabilisation, a 7-point phase-change AF system (that of course works with all Four Thirds lenses), faster 4fps shooting and a 2.7in / 230k dot flip-out screen, albeit at a launch price costing around 20% more than online prices of the G1 at the time of writing. It’s pricier and larger than the G1 and also a different proposition as a traditional DSLR, but it looks set to be a big seller. Panasonic’s Lumix DMC-G1 is a highly capable and thoroughly enjoyable camera to use. The 100% Live View system with flexible screen and detailed viewfinder are a joy to compose with, the controls and handling quick and easy, the image quality comparable to the best of the current budget DSLRs, while the low size and weight ensure it never becomes a burden. And while the choice of body colours and Intelligent Auto mode suggest beginners as a target market, enthusiasts are also well-catered for with features like seven-frame bracketing which are not normally offered until mid-range or semi-pro DSLRs. There’s certainly a lot to like here, but equally a few key downsides. Like all new standards, there’s a limited lens selection at launch and the ability to mount existing Four Thirds lenses via an adapter of little consolation when most suffer from AF restrictions. For all that’s great about the G1’s Live View Finder, there’s counter-arguments of a noisy and jerky image under very low light. The 100% Live View experience inevitably has an impact on battery consumption, and the lack of a movie mode an annoying omission given the buzz around the capability and a future Lumix G model already having the capability. So we wouldn’t recommend the Lumix G1 to anyone who’s really into low light shooting, requires a wide lens selection from day-one, or of course needs video recording capabilities. But these caveats only eliminate a relatively small number of photographers. Everyone else will find a camera that combines the size and ease of a typical super-zoom with the quality and (potential) optical flexibility of a traditional DSLR; the two kit lenses are also pretty respectable. As such even with a forthcoming model bringing video to the equation, we can Highly Recommend the Lumix G1 and look forward to seeing how Micro Four Thirds develops. Large and detailed viewfinder image. Flip-out screen with detailed image. Easy to use and good user interface. Viewfinder noisy and jerky in low light. AF restrictions with Four Thirds lenses. Battery life below most DSLRs.